A nice dungeon crawler! 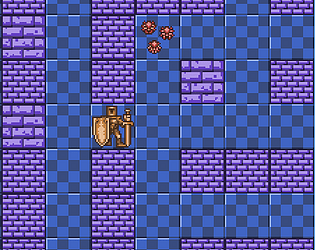 It would be good to have a more elaborate fighting mechanic, so you can see the effect of level, attack, and defense. For example, show monster level and hit points, and have a fight take multiple turns. This could be a nicely fast-paced game if it wasn't for the slow scrolling. The scrolling was as good as I could get in a limited time. I had it set to twice the speed it is in this version originally, but it was too fast and made it feel like the screen was "snapping" to the player. I use gamemaker which (as far as I know) doesn't offer a "smooth" follow camera natively meaning I would have had to code it myself. Fights actually can take multiple turns if you are under-powered enough. If you don't collect the weapon in the level, every "boss" character should always take two or more hits. It might be hard to notice if you're playing fast though, since it's doing a check every frame. I'm sort of torn on making the enemies health visible. I sort of like requiring players to encounter an enemy before they know for sure what its attack power and hp is because it makes fights more risky. I can understand why someone might find it frustrating though. If you have any suggestions for a middle-ground I'd love to hear them! Thank you! This is only my third Jam. I'm just a hobbyist so making something enjoyable with solid gameplay is exactly what I'm aiming for. Really nice game, I love dungeon crawlers amd mazes. Unfortunatelly I don't really see much of the theme here, except the fact that the camera takes time to pan. I'm sorry i don't see the theme in this game. Where is the "limited view" or am i just blind(lol). But if the theme was cute-pixel-dungeon-crawler or sth. this would be a really awesome entry.